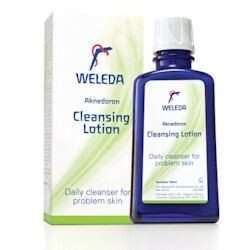 Aknedoron Cleansing Lotion is a daily cleanser, which freshens the skin, gently but effectively. With carefully selected natural ingredients include refreshing essential oils of orange, grapefruit, lavender and rosemary; soothing calendula and chamomile; and with sunflower and olive oil based cleansers. 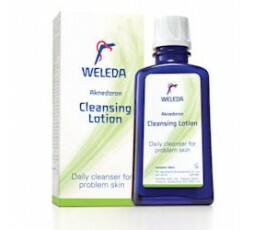 This special combination cleanses without stripping the natural oily layer, which protects the skin from the environment, gently restoring the skin's natural balance in preparation for the restoring action of Aknedoron Purifying Lotion. Specially formulated to deep cleanse and freshen problem skin, containing organic Chamomile extract and biodynamic Calendula extract known for their anti-inflammatory and soothing properties. Tip: can also be applied to refresh and revitalise the skin during hot weather or whilst travelling. INCI: Deionised water (Aqua); Sunflower and Olive Oil Soft Soap (Helianthus annuus and Olea europaea Soft Soap); Rice starch (Oryzae amylum); Tinctures of Chamomile (Chamomilla recutita) and Calendula (Calendula officinalis); Essential Oils* of: Orange (Citrus dulcis); Lemon (Citrus limonum), Lavender/Lavandin (Lavandula angustifolia/Lavandula hybrida), Rosemary (Rosmarinus officinalis), Grapefruit (Citrus grandis); Juices of Lemon (Citrus limonum) and Grapefruit (Citrus grandis) ; Lanolin; Oleic acid. *Contains natural constituents Limonene, Linalool, Geranoil and Citral.